If you like randomly-generated retro dungeon hacks, you'll want to take a look at Cladun: This Is An RPG! NIS America has announced that Cladun: This is an RPG! will be released for the PSP as a PlayStation Network download on September 21. This is a game that will definitely be under the radar for most, but the segment of gamers it's aimed at could be in for some fun. Just in case you couldn't tell from the name, Cladun is an RPG that sends players into what its developers call "Ran-geons," or randomly-generated dungeons with 99 floors. Players will have to deal with traps that might heal them, summon monsters, or cause damage. It appears to be similar to a roguelike. Though players will control only the main character in battle, they won't be going it alone. 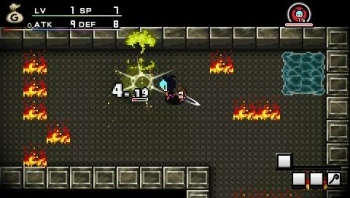 Sub-characters are placed in the game's "Magic Circle" system that protect the main character from attacks, improve damage dealt, and provide other effects. NIS says 100 different Magic Circle alignments will be available and artifacts can also be equipped which power-up sub-characters even more. The main character itself can be created from scratch using Cladun's pixel editor, similar to the character editor in 3D Dot Game Heroes. Once drawn up (with pre-drawn characters also available), the character can be further customized, including the ability to choose various jobs and even his/her arch-enemy. Different jobs come with different Magic Circles and abilities, with characters able to change jobs as they level up. Players will try to get as much "Fame" as possible by completing dungeons quickly, and titles will be awarded that change armor and weapon capabilities depending on which are equipped. There is also a wireless ad-hoc multiplayer mode that supports up to four. The game's website has more info and is partially a retro RPG by itself (with Cladun nonograms available, if you're into them). If the price is right, Cladun should be an easy purchase for RPG fans looking for a dungeon hack.